When you drive up to Unique Photo’s single-location store on busy Route 46 in Fairfield, New Jersey, you might be instantly impressed by the conveniently accessible location and the sheer size of the boxlike, textured concrete structure. But once you walk through the neat, understated entrance, enter the vestibule and look around, it becomes clear that this is no typical big-box store. A big calendar chart on the left-hand wall immediately stands out, displaying an extensive listing of educational classes and store events. And there are a couple of charming historical posters showing what the store and one of its founders, Harriet Sweetwood, looked like back in the 1950s when it was just a Main Street camera store in Hoboken. When you swing open the doors and enter, you’re mesmerized by what has got to be one of the most pectacular retail spaces of any photo specialty store in the country. It is absolutely monumental—5,300 square feet of inviting, brilliantly lit, meticulously organized retail space with a 30-foot ceiling. It makes you feel that you’ve entered a magical world where anything is possible and everything a photo enthusiast or professional photographer could possibly want is instantly available—which is not too far from the truth. Since we last visited Unique Photo back in 2011, Matt Sweetwood, Unique’s charmingly jovial president and co-owner, has added about 2,000 square feet of retail space by repurposing a tiny fraction of the store’s cavernous 50,000-square-foot warehouse that’s only a short walk from the showroom floor. The new addition houses the Canon Pavilion, which Sweetwood aptly describes as a store within a store. It has virtually every SKU in Canon’s imaging catalog on display—the complete line of cameras, lenses, lighting equipment and accessories as well as the largest and most diverse display of Canon printers we’ve ever seen in one place. Just beyond is the very busy and extremely successful rental department, whose primary mission is supplying high-end lenses and gear to pro photographers covering specific assignments. The rental area is flanked by a huge space devoted to camera and equipment bags that’s organized in long, continuous shelves (a system that’s more space efficient and accessible than a conventional hanging display), a large and varied forest of tripods (both folded and open so customers can get a hands-on sense of their size and functionality), and an impressive display of professional lighting gear, including a giant background for demonstrating lighting effects and taking test shots. It is clear that Unique Photo is focused on optimizing their customers’ in-store experience as well as offering a phenomenal range of products for immediate purchase. The largest continuous area of Unique Photo is organized into attractive sections along the left-hand wall, each showcasing a comprehensive display of leading brands, including Nikon, Fujifilm, Samsung, Olympus, Panasonic, Sigma, Tamron, Ricoh/Pentax and more. On the right-hand side are boutique-like Sony and Leica areas that display the latest merchandise in gleaming profusion. Near the front of the store is a customer welcoming area that’s flanked by an array of photo kiosks. At the rear corner, there’s an inviting full-service Red House Roasters coffee bar and Wi-Fi lounge that offers Kobrick’s coffee, tea, espresso drinks and light snacks, as well as fascinating knickknacks for sale. It’s flanked by tables and chairs where customers can enjoy their drinks and food, or simply hang out and relax. The overall ambiance at Unique is attentive but low key; the entire store is immaculate, and the folks behind the counters are friendly and forthcoming without being overbearing. All the salespeople are extremely knowledgeable—which is not too surprising since many have been or still are professional shooters and/or have strong backgrounds in photo education. Here’s a revealing anecdote: The lens on the APS-C-format DSLR we brought along to shoot pictures of the store was an 18–135mm. It was not quite wide enough to capture the full grandeur of the prodigious space in a single shot, so we asked to borrow an 8–16mm ultra-wide lens. As we chatted with the salesperson who got us the lens about the latest marketing and tech trends, it became clear he was not only a genuine people person who was up on all the latest camera tech, but he was also a highly qualified professional who was able to give us sound advice on shooting angles, exposure and lighting. 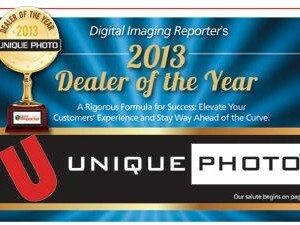 Having a staff that’s knowledgeable, friendly and forthright is one of the greatest assets of Unique Photo, and it’s a key reason why the company has been posting double-digit sales gains for the past several years while other retailers may be treading water. “We don’t just sell equipment,” said Matt Sweetwood. “We sell photography and the photographic experience. If one of my salespeople explains to a customer that the two lenses in his outfit will do the job and he doesn’t really need that additional lens he fancies, I consider that a successful interaction because the customer gets the priceless message that we’re straight shooters. That means he’ll not only come back for more, he’ll also tell that story to 10 of his friends. We’re in this for the long haul, not just the short-term bottom line. These ringing statements were certainly borne out by what we witnessed in our impromptu tour of the large, well-appointed classrooms of Unique University. In the first one, a veteran instructor was preparing to deliver a lecture to a class of several dozen students on how to get the most out of their newly acquired DSLRs. We caught him a few minutes before the students arrived, writing a basic outline of the course on a blackboard. At each desk was a packet of written guides and pamphlets aimed at beginner and intermediate students, and a pen and pad for taking notes. In a second classroom, we tiptoed around as we observed an award-winning professional photojournalist delivering an entertaining talk to more advanced shooters, projecting pictures of his work and providing suggestions and techniques for creating more impactful images. A third, large room was set up for teaching postproduction techniques, and there were over a dozen workstations, all equipped with the latest high-end computers and large-screen monitors. All this represents an investment and commitment at the highest level, and it’s a very impressive undertaking for any retail establishment, even one as large and well funded as Unique Photo. As you would expect, Unique Photo also conducts an extensive mail order and online business, and the overall power and reach of the company is really brought home when you step into their warehouse—a cavernous space that is equipped with conveyor belts and all the latest packaging and package-handling equipment. 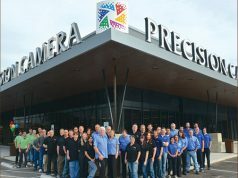 To say that this warehouse would do justice to a major distributor is stating the obvious, because Unique Photo is one of the largest privately owned photographic supply distributors in the world. Just ogling at the seemingly endless tiers of equipment boxes, ranging from thousands of point-and-shoot cameras and hundreds of professional-grade lenses to gazillions of tripods, printers and accessories, is a mind-boggling experience. And when you realize that the wholesale value of what you are looking at represents millions of dollars invested in the future, you get a good picture of the risks and potential rewards of staying ahead of the curve. Indeed, that is the underlying philosophy that embodies and motivates Unique Photo. Although Unique Photo moved into the modern brick-and-mortar building it now occupies only six years ago, the company traces its roots back to 1947 when the late Bernard and Harriet Sweetwood opened a small photographic supply outlet in Brooklyn, New York. Not long afterward, they expanded into the retail arena, opening a series of camera departments in about 30 department stores across New Jersey. Later on, they opened a medium-size stand-alone camera store, Hoboken Camera Center. The present facility was conceived by the founders’ sons, Jonathan and Matthew Sweetwood, CFO and COO, respectively, who took over the daily operations in the 1980s. Alexander Sweetwood, who earned an MBA at Montclair State University, became the third generation of the family to enter the business, joining the company as vice president of Operations and Purchasing. “By running a family owned business, we have been able to maintain the fundamental values that have kept us in the forefront of the industry,” observed Matt Sweetwood. “We also selected our location very carefully. It’s dead center in Northern New Jersey at the intersection of the three most populous counties in the state, Essex, Morris and Passaic, and it’s located right on a major highway. From the very beginning, our main object was to create a destination store that is convenient to get to, and a close second was to give our customers good reasons to make the trip. “To that end, we provide them with a fulfilling and positive experience, and the best customer service on Earth. We select our employees very carefully to ensure that they’re photographically knowledgeable, friendly, courteous and genuinely enthusiastic about photography. They’re well dressed in casual uniforms so customers can easily identify them. We’re fanatics about customer service, cleanliness and effective merchandising. And I don’t mind copying some effective strategies from big-box stores when it really helps to move merchandise. A good example is stacking a bunch of tripod or printer boxes and placing an actual tripod or printer on top of it with a ‘special sale’ tag affixed to it. That really works. “These days, competition is fierce and everyone can check out prices instantly on the Internet,” noted Sweetwood. “So we have to offer prices that are competitive. When potential customers do this, they’ll find that our pricing is low, the selection is wide and we actually have the items in stock for immediate delivery. “We also offer an extensive range of services, including a professional-quality on-site printing lab and probably the best rental department in the state. When pros or serious shooters rent something like an exotic tilt-shift lens or a Steadicam Merlin, our knowledgeable rental staff will walk them through how to use it. We also take trade-ins and have a used camera department. But the key element that sets us apart is our commitment to education. “Unique University is the largest photo education program in the country,” continued Sweetwood, “and our mission is to help our customers, everyone from novices to experts, create better pictures and elevate their picture-taking experience. We have daily events, and we’re a meeting point for local camera clubs, the ASMP, PPA and other organizations. We offer a full curriculum of classes and seminars with world famous speakers like Lindsay Adler, Will Crockett, Rick Sammon and Art Wolfe, and off-site photographic experiences at exciting venues that include Nets basketball games, the Meadowlands Arena and the Lakota Wolf Preserve, as well as one-on-one personalized instruction. As Matt Sweetwood eloquently concluded, “If there is one thing I learned from my parents’ experience in constantly having to reinvent their store and dramatically revise their business model, it’s the transformational concept that the time to reinvent yourself is when you’re at the peak, not when the world has changed around you and you’re desperately scraping to survive. “As you can see, this store has changed dramatically over the past two years, physically, conceptually and in terms of our educational and outreach programs, as well as our online presence. In a period of extraordinarily rapid technological and societal change, you can be sure it will change even more dramatically over the next few years, not merely in its appearance but in its basic operational structure. This is not change merely for the sake of change, but evolution that is essential if we are to survive and prosper going forward.